I’ve been to a couple of sushi restaurants recently and I felt an urge to cook Japanese food afterwards. 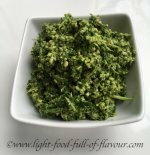 Everything I’d eaten – from sushi to salads and hot main courses - had been so incredibly tasty. So I started to look at recipes for Japanese hot dishes and vegetables and goodness me, what an amazing amount of sugar they use in a lot of dishes! It seems counter-productive to me when you add 3 tablespoons of sugar to a marinade and then pour it over otherwise healthy vegetables. I can’t see the need for the sugar when there are so many other tasty ingredients in the marinade. 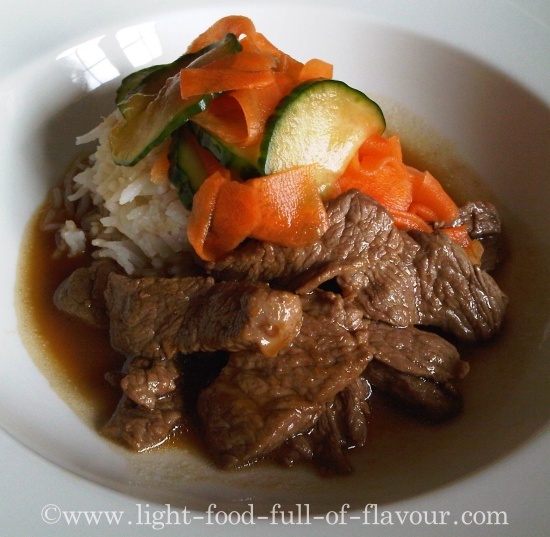 I used a recipe I had for Japanese-style beef with marinated cucumber and carrots and swapped the sugar in the vegetable marinade and stock for the beef for a bit of honey, and cut down on the amount of soya in the stock. It tasted amazing! 1. Using a whisk, mix together the ingredients for the marinade in a bowl. Add the thinly sliced cucumber and carrot ribbons to the bowl, mix well, cover the bowl and place it in the fridge. Leave to marinate for 1 hour (give the vegetables a stir half-way through). 2. Once the vegetables have been marinating for 30 minutes, place all the ingredients for the stock in a pot and bring to a simmer. Simmer for 30 minutes before straining the stock through a sieve into a clean pot. 3. While the stock is simmering, cook the rice or quinoa according to pack instructions. 4. Heat the oil in a large frying pan or wok over quite a high heat. Once the oil is sizzling, quickly stir-fry the sliced beef - until browned - and season with salt and pepper. Transfer the beef to the pot with the stock and bring to a simmer for 1 minute. 5. Place a portion of rice/quinoa in 4 bowls or deep plates, divide the Japanese-style beef and stock between the bowls and top with the marinated vegetables.